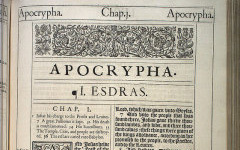 Shalam brothers and sisters we have uploaded a new version of the Apocrypha with corrections that were made to the book of Baruch, Bel and the Dragon, and Prayer of Manasses. For better navigation we added bookmarks; in Adobe reader on the top right hand corner click the icon that will show the side bar then click on the Navigation icon. Sometime soon this page will contain the breakdown of proving the authenticity of the Apocrypha according to the scriptures. Please look out also for those podcast lessons. Shalam!